Do you want to start your adventure with skiing / snowboarding in Szczyrk and do not have your own equipment? Nothing lost! For sure we will find something for you. Skitown ski and snowboard rental in Szczyrk offers a wide range of ski and snowboard equipment from top brands, ie atomic, head, Fischer, … The best quality guarantees full ride comfort! . The equipment will be selected according to the needs, capabilities and skills of the client. We have equipment for both adults and children, in all sizes. We adapt it to the weight and height of the client, which will increase comfort and safety of driving. We know that mismatched and misplaced equipment poses a danger to the user, that’s why everything is done professionally! Each time after handing over the equipment is checked and serviced by our employees on an ongoing basis. The most important thing for us is the satisfaction of every customer! 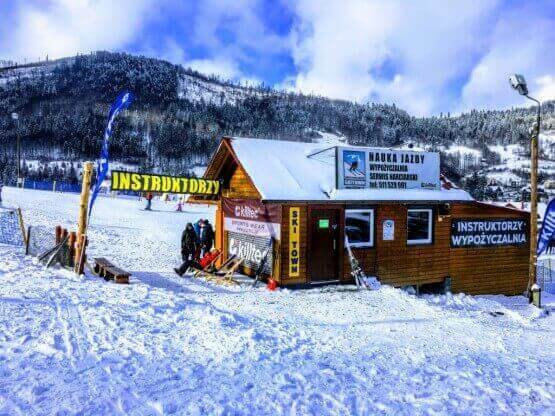 * Ski set (2 hours) in option with SkiTown instructor – helmet for free !!! * snowboard set (2 hours) in option with SkiTown instructor – helmet for free !!! Ski Rental Szczyrk welcome !! !